Over a 40-year span, Quinten Gregory imparted valuable information and techniques about painting realistic landscapes and wildlife in oil and watercolor. 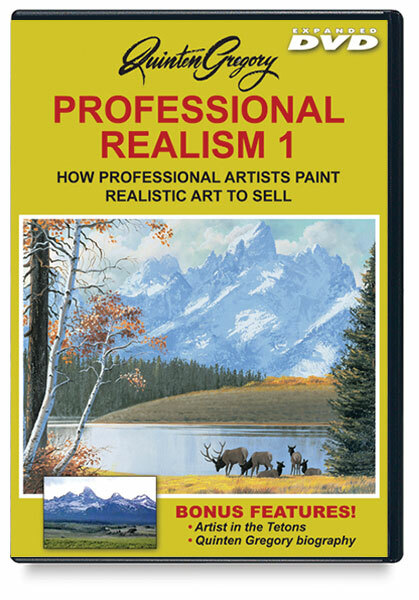 He then distilled this information into a series for painters who want to develop their skills to a more professional level. Each DVD has many carefully analyzed scenes to show what professionals need to know about each subject. With the purchase of the 5-disc set of DVDs, you'll receive a free handbook — a 99-page, full-color complement to the series. Each DVD is approximately 60 minutes long. 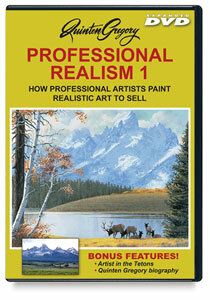 Professional Realism, Set of 5 DVDs — This set includes all five volumes in the Professional Realism series. Also included is a 99-page, full-color handbook. Each DVD is approximately 60 minutes long. Return Policy — We regret that we cannot give refunds on videotapes, CD-ROMs, or DVDs. All sales are final. In the event of a defective cartridge or disc, we will replace it with an identical one.